A yellow weather warning for strong and potentially damaging winds has been issued by the Met Office for our county on Friday. There is the potential for gales to affect southern parts of England and Wales on Friday, February 3. The most likely scenario is for gusts widely in the 50 to 60 mph bracket, which could affect travel and produce some minor damage. A Met Office spokesman added: “Gusts of 60 to 70 mph may still occur, whilst there remains a small chance of 80 mph gusts in exposed coastal areas. 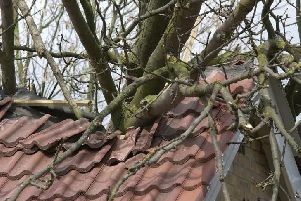 If such winds were to happen, we would expect damage to trees and perhaps to buildings, possible disruption to power supplies, as well as delayed travel. The Met Office has not yet designated the front a storm name, the next would be Storm Doris, as it is not thought to be large enough at this time.